YAY! 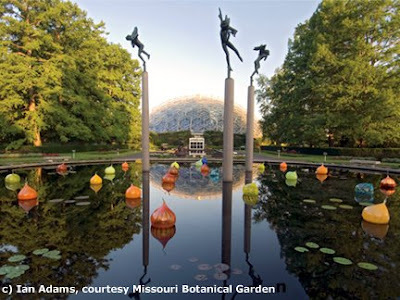 My friend Carole and I will be visiting MOBOT (Missouri Botanical Garden) on Friday, August 21. I've already contacted a few folks along our route — Beckie, Rose, and Lisa — about stopping by their gardens. But if you live near MOBOT or want to plan a little road trip of your own, we'd love to meet you there. We'd also appreciate lodging (simple, safe) and restaurant (open to everything) tips from locals. And if you've visited MOBOT, let me know your favorite spots. And, most pressingly, what's the freakin' difference between botanic and botanical in garden names?! Word geeks want to know! Hi Monica, wish I lived closer. You are bound to have a great time. BTW, what are those colorful pods floating in the pool? I am so tempted to plan a visit to St Louis to see my sisters! Let me think about this~~my son may be home that week! It's a great place to visit....and the city has much to offer. Do plan a trip to the zoo! I wish i could tell you were to stay there Monica. I have been there a couple of times but always as a day trip since we live so close. Have a great time - looking forward to hearing about it! Interesting photo, what are those onionish things in the water? Monica, can't wait to see you! You will have to take my garden as you find it, though. Between now and then I will have little time to do much needed work on it. :( Wish I could take a couple of days off to go with you. I've always wanted to see those gardens. Love that shot! Have a great time and post lots of pictures. I want to visit there one day. I hear that it is one of the nicest botanical gardens in the U.S.
Monica! Your are on the move this summer! Great; then you can post and I can delight in your photos! This year is not a good year for me to be travelling but there's always next!! Clang, clang, clang..zing, zing ,zing!! Du bist ja wirklich sehr viel unterwegs in letzter Zeit. Ich wünsche Dir eine wunderbare Reise und viele schöne Eindrücke. Uns wünsche ich tolle Bilder anschließend. Komm gesund zurück. Oh yes, that sounds like a very nice place to visit. I can't wait for your report and pictures! Sounds like a fun trip you have planned. Tell Beckie & Rose I said hi! :) Can't wait to hear all about it and hope you take lots of photos too. Hi Monica! You are really getting around this summer! :-) We drove through St. Louis last week... on the way down to Atlanta and on the return trip home Friday. (No stopping until we were west... for a quick bite to eat.) I'll look forward to your pix. Sounds delightful, Monica, and if you can hook up with Thelma & Louise, even more so :) You lucky gal! Anxious to see your photos and wishing you a safe journey back home (dragging nice weather with you, I hope)! I still get upset because I never got a chance to visit MGB when I was out in St. Louis. My wife will never outlive that mistake. Do all the visitors get a pedestal to leap off?
. . . I came by to mention a gardening blog I've just come across. It looks really lovely - the photos sort of blend in with the overall look - but I don't speak German and there's a lot of text . . .
and that she might be interested in Blotanical blogs too - probably not mine though! Anyway, I wondered if you might like to check it out? The title is Swedish but she lives in Niederrhein. Her emphasis is on vegetables, I got that much - but she manages to make them look really pretty. Interesting to know what you think.